If anyone knows why these two should not be wed, shoot now or forever hold your peace lover. Imam Kcarab Niessuh Amabo – If anyone knows why these two should not be wed, shoot now or forever hold your peace lover……… Mashoom Sheepkissah, do you take nine-year-old Aisha Lookslikeagoat to be your Shari’a-lawfully-wedded third wife, to have and to abuse, to beat and to maim, until her murder at your hands next week do you part ? Mashoom Sheepkissah – I do. It is my sworn duty as a typical bitterly-clinging and Jew-hating genocidal Son Of Allah (PBUH). Imam Kcarab Niessuh Amabo – Aisha Lookslikeagoat, you have no say in the matter. I pronounce you married. Allah (PBUH) be praised, that was the last one for today. Now is the time for proper celebration. Family and friends in attendance – What a happy occasion ! Let’s beat some people to death in the name of Allah (PBUH) ! Anyone who survives gets arrested as an infidel ! Uluuluulullululullulluuuuu ! This entry was posted on Friday, March 9th, 2012 at 09:13 and is filed under Main Postings. You can follow any responses to this entry through the RSS 2.0 feed. You can leave a response, or trackback from your own site. One Response to If anyone knows why these two should not be wed, shoot now or forever hold your peace lover. What?? 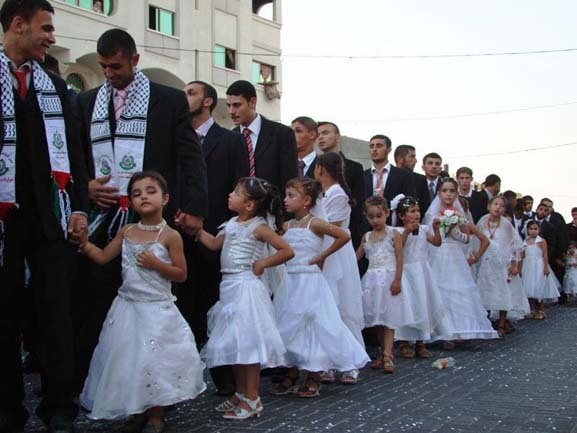 What’s wrong with marrying 9 yr old girls and beating people to a pulp? Can’t a jihadi guy have some fun?